and the objective of the system is to assure the desired trajectories can accurately followed through the mechanical range of the system. Due to the manufacturing precision of the components, such as linear guides deflections, ball screw lead errors, axes misalignment, the variation of the position errors in X1 and X2 axes controllers, XY gantries orthogonality is effected. As Y-axis with load traverses across XY plane, it also introduces X position errors that are Y axis position dependent. The current approach to this challenge is to implement 2-D position error mapping or suspend Y axis on the flexible members (flexures) and independently control X1 and X2 axes to assure orthogonality. There are also many applications, where large angle misalignment (non-orthogonality) is an intentional feature of the system design (X-Y theta). The mechanical design described above would only be limited to very small angles, like 1-2 degrees at most. IntelLiDrives manufactured an innovative large area XY gantry where Theta angle can exceed 20 degrees. The new kinematic approach allows large relative motions of the independent X1 and X2 parallel axis. Such approach not only allows to control orthogonality or introduce large rotation of the Y axis about X1 and X2 axes, but also rotate Y axis around virtual programmable point. The system contains two pivot point on X1 and X2 axes to allow Y cross-axis to rotate around each of X-axis and be displaced linearly about each of them. The dual axes gantry controller can independently control both gantry center position and theta. 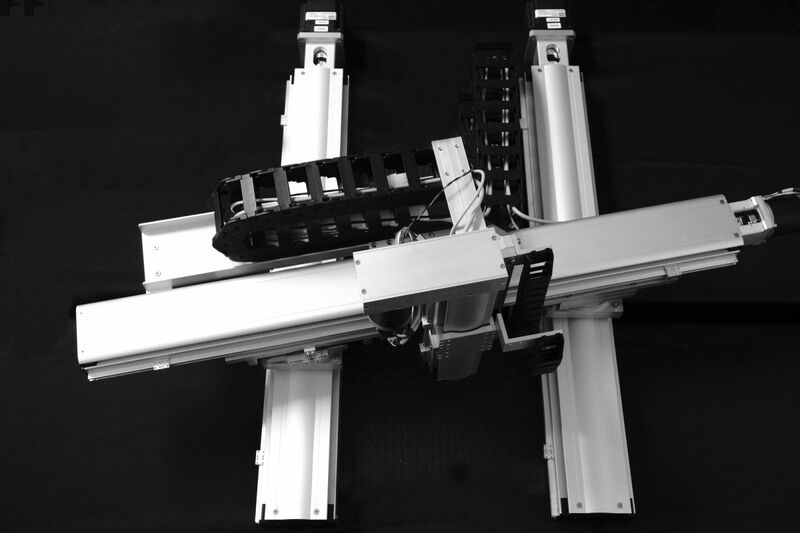 Though the current system was manufactured with motorized ball screw actuators with brush-less servo motor/encoders, given approach also easily lends itself to system design with direct drive linear servo motors. The system described above was deigned for the XY travel 800 x 800 mm travel, with 20 degrees Y axis rotation. Theta angle control achieved resolution 1 arc-sec with repeatability 3 acrs-sec. Gantry was successfully installed in the semiconductor wafer and reticle alignment application.